The Edmentum Exact Path Individualized Learning Solution is a K-6 online curriculum product that provides standards-based instruction in Reading, Language Arts and Math. The Exact Path learning experience constructs individualized learning paths for students based on results of the included diagnostic assessment and tailors student learning based on their performance throughout the system. The Exact Path interface is kid-friendly, of high quality, and customized for students in both lower and upper grades. There are a number of tools available for students to use within lessons including a highlighter, translator, and notepad tool. Instructional design of the program is based on a linear computer-assisted instructional model where information is presented through different combinations of text, images, animations and videos, followed by a comprehension check. Most lessons consist of a direct instruction component, one or more practice activities, and a mastery assessment. Assessment items include multiple choice and matching exercises, as well as written responses, both short and long. In math lessons, students also use the built-in word processor to input equations and solve problems. 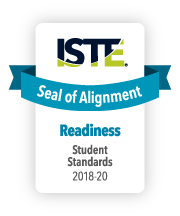 The Edmentum Exact Path resource successfully underwent the International Society for Technology in Education (ISTE) Seal of Alignment review for Readiness. Reviewers determined this resource helps build foundational technology skills needed to support the ISTE Standards for Students. Exact Path contains features and components that collectively contribute to laying a foundation of basic technology skills that enhance awareness of technology applications.